The Itsy Bitsy Spider Crochet: Dunnys and Labbits and Dopplegangers, oh my! Dunnys and Labbits and Dopplegangers, oh my! A while back, I did a blog buddy swap with Becky from The Strumpet's Crumpets. I just love her style and I've been "haunting" her blog ever since. Well, after seeing some pictures of Becky's Dunnys on her blog, I had to check the little buggers out for myself. 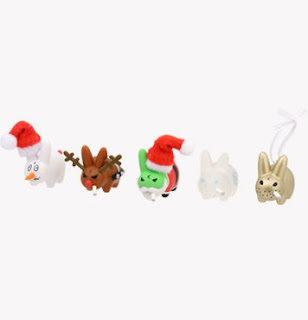 The fun part about them is that Dunnys come in a blind box assortment. That means you have no idea which Dunny you're going to get until after you open the box. Lame as it may seem, opening each Dunny is kind of like Christmas morning to me and I love the rush of not knowing what I'm going to get. My husband and I have taken to purchasing a Dunny when we go out or date night and then opening it over cocktails. Sad but true... we skip the movie and the fancy chocolates and flowers... just give me my Dunny rush! I'm not exactly sure where I'm going with this post... but, as out latest Dunny purchase peeks out at me from behind the computer monitor, I decided I just had to tell someone. I wonder if Kid Robot would ever consider doing a Fuzzy Whazzit line? 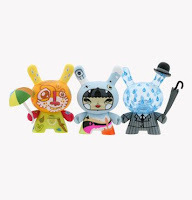 :) woot woot for dunnys! I bought the christmas dunny for 09! I'm so excited! I love the crocheted weird bunny fish thing! I thought of you and your awesome amigurumi!